Associate Professor in the Department of Marketing and International Business, Vice Dean of International Business at Universidad del Pacífico and researcher at the Research Centre of the University. He holds a PhD in Economics and Business Management from Universidad de Deusto (Spain) and a degree in economics from Universidad San Martin de Porres. He has specialization studies in International Trade by ALACCI, the UNCTAD International Trade Centre and GATT. He was a scholarship holder at the Training Program of the Fonds Leon Bekaert of Belgium. He is a speaker and visiting professor at various universities in Latin America, a member of the Scientific Association of Economy and Business Management (Spanish: ACEDE), representative of Universidad del Pacífico at the Academy of International Business (AIB), and member of the European International Business Academy (EIBA). He has been a member of the Commission of International Treaties of the Chamber of Commerce of Lima. 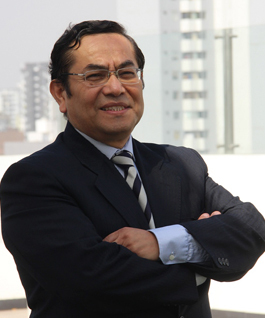 He has developed several specialized projects and studies on agricultural export markets for Peruvian companies and abroad. He has been manager of engineering, agro-export and metalworking companies. He has been general manager of ALPHA, academic director of the Exporters Association of Peru and the Latin American Association of Training in International Trade. He has participated in various fairs and trade missions in different countries in Europe, the US and Latin America. He is a consultant to institutions such as the World Bank, the Inter-American Development Bank, the International Trade Centre UNCTAD, the World Trade Organization Geneva, the World Resources Institute in New York, Save the Children, and the Andean Development Corporation. In Peru, he is a consultant to the Ministry of Agriculture, PROMPERU, MINCETUR, Ministry of Foreign Affairs, ALAC in Cajamarca, and the INCAGRO project - IDB RAMP - Peru. Export Performance, export promotion, internationalization strategies, international trade operations management, export market research, Multilatinas (Multinationals in Latin America), agricultural exports.